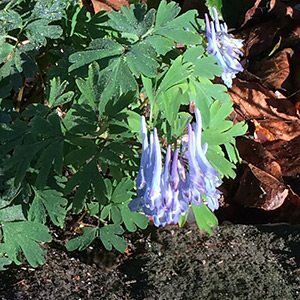 One of the most sought after blue flowering woodland plants is Corydalis flexuosa. Very attractive ferny or lacy foliage and clear blue flowers, this is an easy plant for dappled shade. Originally from China, this is a species that has been grown in gardens around the world for many years. Hybrid varieties with different foliage, some with different blue colour in the flowers are also available. Flowering in spring, the foliage and flowers last well through to summer in the right conditions. Easy in the garden, and also suited to grow in pots or containers, Corydalis flexuosa will slowly spread to form a nice clump. Choose a position in light shade, beneath a deciduous tree works well, or try a shady position in a courtyard. Dig in some well rotted compost and cow manure before planting. Top dress each autumn after the plant has dies right back. A little well rotted compost and some blood and bone will work well. You can also use a slow release general purpose fertiliser in spring if you wish. Height – Will reach around 20 cm to 30 cm in height. Spread – Will spread to form a clump of 40 cm over time. Flowers – Trumpet shaped blue flowers in clusters. Foliage – Lacy or ferny green. Flowering period – Spring through summer. Although Corydalis flexuosa may go dormant in very hot summers. It will bounce back as weather cools, and moisture returns.